Just a short blog update, there’s been plenty of miles of swimming, cycling and running, but most of those miles have been quite boring… Well, from a blogging-point-of-view anyway, the actual miles weren’t boring at all, I really enjoyed most of those, but no-one would be interested in every inch of road that my bike rides… With race-season well under way, I hope all of you are doing well, in training and racing! This month there were no more ultra-run training sessions, but the intensity, on both the bike and the run, went up. Quality over quantity, and, as a diesel-engine, those are not my favourite training-days. I rather go for a 6 hour run and enjoy the course, than push hard on a one hour run, and come home completely shattered. But it’s all part of the ‘bigger plan’, and every time I push myself through a hard training, my confidence gets a little boost… And while the long runs are over (for now, at least), there’s still plenty of training hours during a busy week! 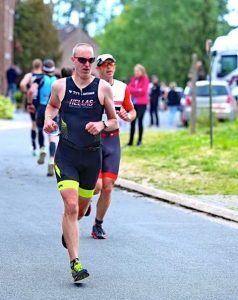 It’s been 11 months since my last triathlon (the full-distance ‘Challenge Denmark’); last year the main focus was marathon running, so I’m excited to to do a swim-bike-run race again! 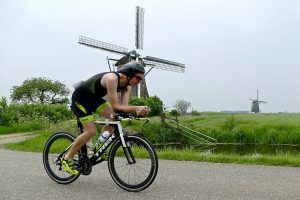 In Belgium I race a ‘111’ race, over an unusual distance: a 1km swim, 100km bike and a 10km run. Unsure about my body (I’ve had some kind of stomach-virus the week before, so I’m now at my perfect marathon-race weight, but without the energy that usually goes with that…). I get into the water, where I experience the thoughetst fight ever… For some reason it wasn’t just an accidental hit in the water, but it was a 1 kilomter boxing match… Happy to get out of the water I get onto the bike, where I just decided to push hard. It was ‘just’ 100km, and more important, the run after this would only be 10km, how hard could it be?